What doesn’t kill us makes us kinder. But perhaps, friends of recovery, it’s time to put on our game faces. So many who are now in long-term recovery from addiction had once been cast aside, assumed dead with no hope for regeneration. Our ‘living deaths’ were defined by context of the substances we used, the ways in which we used them, the ‘failed’ attempts at treatment, the lives we could have been leading if not for bad luck. Recovery became a ‘miracle’ hoped for, until hope was lost — sometimes slowly, often quickly — through hurt and circumstance. And then, for 23.5 million of us in the United States, the miracle happened. We prevailed over illness, against all odds. The New England Patriots were not pronounced living-dead at the end of the first half of Sunday’s game. Their victory has not been described as a metaphysical coup. Determination, teamwork, and a fundamentally human resilience defined the results of Super Bowl LI. Putting aside the effectiveness of spiritual methods on so many instances of addiction, is it not strange that we invoke supernatural phenomena in public discourse to describe recovery from addiction? Should it be considered a miracle whenever a recovery is identified? Have the body counts and status quo of treatment of and for people experiencing addiction become acceptable? Do we not expect more from each other — those of us on Earth — to ensure the best chances of improvement for our loved ones’ circumstances? The long-term wellness of those affected by addiction has historically depended upon survivors finding each other and cultivating sprawling support networks among them. Evidence-based treatment and diverse recovery services are only recently becoming institutionalized, while capacity to meet demand and access to those supports lag woefully behind. Integration of existing recovery supports has only just begun in many communities; others are dotted with disparate supports and large cracks through which many fall. Yet people experiencing addiction are still blamed for not getting well. Willful misunderstanding of addiction and recovery processes are evident in the discriminatory policies and practices affecting 22 million people with a Substance Use Disorder. In spite of any contrary belief, ‘boot straps’, punishment, and overdose are not the answer. We know better. The supports and practices that work for wellness are known; the evidence is continually ignored. Why? Because We Who Know Better have not sufficiently organized. We over-value our differences. And we still take ‘no’ for an answer. Of course, this is not to discount the gains made by treatment and recovery advocates in recent years. 2016 saw passage of the Comprehensive Addiction and Recovery Act, an unprecedented grants suite for prevention, treatment, and recovery programs resulting from inspired community organizing. Our nation’s first Surgeon General’s Report addressing addiction was issued — another victory for progress born from coordinated activism. These, among other high-profile triumphs, should give any of us hope. But the work of demanding and delivering vital services must continue amid considerable setbacks. In 2017, there are real and pressing threats to the lives and health of vulnerable people coming from all imaginable fronts. Objectively, it appears that healthcare and drug policy in America could soon revert to survival of the fittest. We Who Know Better can make a difference. Because 23.5 million people and their families and allies standing their ground can’t be ignored. Included in that tense collective are people using spiritual, religious, secular, clinical, peer-based, medication-assisted, moderation management, and self-fashioned recovery supports. We are parents who used ‘tough love’ and online support groups, and grandparents who waited out storms brewing in our basements year after year. We are physicians who swear by medical intervention, and faith healers, and social workers who talk endlessly about Portugal. We are abstinence-based treatment providers and harm reduction outreach workers. We voted for Donald Trump and for Hillary Clinton. We wrote in ‘Lincoln’ and we stayed home. We are, collectively, The Recovery Community. The common threads connecting recovery support networks are the very fact of our survival and our shared desire to preserve self and others. On these bases, all Americans with empathy or something to lose can unite and make enormous impact. Fourth-quarter survival instinct takes effect without effort on our part. But directing that energy among tens of millions of survivors and allies toward a common purpose? This is the challenge. But we can, and we will, because life depends on it. 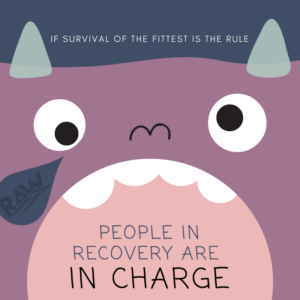 Find your Recovery Community Organization and join a local movement here.